Interesting combination of styles and themes ranging from swing to traditional folk, this CD will surprise you. Born and raised in Wisconsin, Greg now resides in Colorado. Survivor of the Bar Wars; he writes what he knows. Ballads, comic satire, political statements. This CD has it all! It's not about the flavor of the month...the truth is that this CD could be played 10 years from now and still be awesome! Solid folk based intertwined with unexpected twists with a voice that will melt your momma! Backing Ryder are some of the finest musicians out there; Pete Neds, Benny Galloway, Robin Davis, Anders Beck...this CD is a MUST HAVE...Don's miss out! Deep voice, mellow tones and great accompanyment makes for some fine listening. This original work tracks many of the important events in life growing up in Wisconsin, and references places near and dear to Greg and all the family. Always wondered what little brother would do when he grew up.....still wonderin' some. This is an unbelievable CD! Greg has a low voice with style and meaning! The lyrics are what you can relate to. We want more from Greg!! An excellent combination of music! 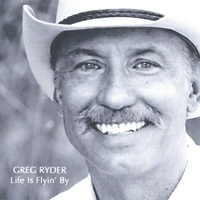 This album is reminiscent(for me) and will stand up to the test of time...Greg has the singing voice that soothes the soul...the kind of music a girl could listen to while riding her horse out on the prairie...really!